Shannon Leigh Akers Johnson of Greensburg, Kentucky, daughter of Kenny Lee Akers of Mt. Sherman and Carol Jean Slinker of Summersville, was born on Tuesday, March 30, 1982 in Hardin County, Kentucky and departed this life on Tuesday, September 25, 2018 at the University of Louisville Hospital. She was 36 years, 5 months, and 26 days of age. She had made a profession of faith in Christ, had her Masters in Speech Therapy, was a licensed Speech Therapist, employed with Personal Touch and formerly with Kids Spot. She was a dedicated sports Mom and was her children's #1 Fan. Besides her parents, she is survived by her husband of 15 years, James Johnson of Greensburg having united in marriage on March 15, 2003; her children: Jackson Johnson, Isabella "Bella" Johnson, and Mackenzie "Kenzie" Johnson all of Greensburg; step-mother: Elizabeth Akers of Mt. Sherman; father-in-law: Rocky Mitchell of Louisville; grandmother: Analeta Bristow of Louisville; four brothers and a sister: Joshua Akers of Summersville, Kendrick and Tiffany Akers of Greensburg, Mckenna and DeeDee Akers of Hodgenville, Wesley Akers of Richmond, and Katie Akers of Mt. Sherman; sister-in-law and brother-in-law: Kim and Steve Hornung of Shepherdsville; nieces and nephews: Alivia Akers of Buffalo, Conner Akers, Aksel Akers both of Elizabethtown, Savannah Hornung, Mckayla Hornung, Gavin Hornung all of Shepherdsville, and Dalton Akers of Greensburg; and a host of other relatives and friends. Shannon was preceded in death by her grandparents: Chester Akers, Maymie Akers, Norman Slinker, Shirley Slinker; and her mother-in-law: Barbara Mitchell. Cremation was chosen. A Celebration of Life Service for Shannon Leigh Akers Johnson will be conducted at 1:00 P.M., Central Time, Sunday, October 7, 2018 at the Cowherd and Parrott Funeral Home. Visitation is requested from 12:30 P.M. until 8 P.M., Central Time, Saturday at the Cowherd and Parrott Funeral Home and after 7 A.M., Sunday until time of the funeral service. The family has asked that expressions of sympathy take the form of donations to the Shannon Johnson Memorial Fund, which can be made at the funeral home. 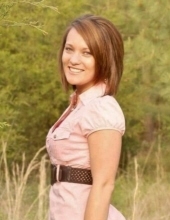 To plant a tree in memory of Shannon Leigh Akers Johnson, please visit our Tribute Store. "Email Address" would like to share the life celebration of Shannon Leigh Akers Johnson. Click on the "link" to go to share a favorite memory or leave a condolence message for the family.